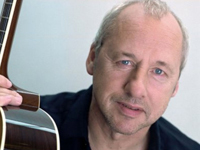 Mark Knopfler is a guitarist, singer, songwriter, and bandleader. His group, Dire Straits, was formed in London in 1977 and went on to become an international success after the release of its debut album in 1978. Though it began as a group with a permanent lineup led by Knopfler, in its first few years it evolved into a brand name for Knopfler with varying personnel. Starting with Local Hero in 1983, Knopfler has scored several motion pictures. He has also recorded with Chet Atkins and with the Notting Hillbillies. In 1995, Knopfler quietly laid Dire Straits to rest. He launched a full-fledged solo career with the release of Golden Heart in 1996; subsequent soundtrack efforts include 1998′s Wag the Dog, 1998′s Metroland, and 2002′s Shot at Glory. Sailing to Philadelphia, a lush collection of folk-rock and breezy Americana that featured guest appearances by James Taylor, Van Morrison, and Squeeze leaders Glenn Tilbrook and Chris Difford, appeared in fall 2000, and Ragpicker’s Dream followed in 2002.